How do I set the Ad Unit Test mode? What ad types does Yahoo support? Should I add rewarded video ad units to my app? Can I change my full screen ad unit from rewarded to non-rewarded and vice versa? How do I set up my rewards? How do I specify the amount of rewards to be given to the user? Is a callback url required to set up rewards functionality? Why aren’t my callbacks working? Where can I get detailed information on the methods and classes used to integrate Flurry SDK? Do you impose any frequency caps on how often an add can be seen? I’ve set up specific filters for my Ad Unit. How can I easily copy that to other ad units? How can I control the language of the ads in my app? How long does it take for changes in ad preferences to take effect? How often is reporting updated? Where can I export my reporting data? Where in my app should I put my Ad Unit? How do I exclude certain advertisers from showing in my Ad Unit? Do I need access to the dev portal to create an ad unit? Do I need to be a developer to create an ad unit? What changes can I make to the Ad Units after the app is live? Can I change the look and feel of Flurry ad units? Why do I see a blue triangular icon on some of the ads served in my app? An Ad Unit is an area within your app that is designated to display ads. You can create as many Ad Units as you like, and customize the size and serving rules of each. Setting an ad unit into the test mode is meant to help you validate the integration. The test mode removes any content or geo filtering and delivers the ads into the ad unit. The test mode configuration can be done in two ways: in your application code or on the dev portal - by providing the ID (The IDFA or Google Advertising ID) of your test device to which the test ads are delivered. The advantage of setting the test mode in your application code is the immediate validation. However, you need to make sure to turn the test mode off (by removing the code or by explicitly setting the test mode to false / NO) before launching your app. For instructions how to set test mode in your Android application code see. For instructions how to set test mode in your iOS application code see. The advantage of setting the ad unit into the test mode on the Flurry’s dev portal is that it can be turned on / off at any time (even when the application is live in production). To set the test mode for your test device, on the flurry dev portal go to Monetization tab, on the left hand navigation bar select Apps & Ad Units, and select the ad unit in question. In the Advanced Options section, provide the comma separated IDs (IDFA for iOS ad units, Advertising ID for the Android ad units) of the test devices in the Advanced Options section. The test ads are then served to these devices. Note that test mode is available for Yahoo Gemini originated ads only. The ads that are served via RTB market place can’t be put into the test mode. You can filter out the ads from showing in your Ad Unit by setting filters under the Filters section of your Ad Unit setup. Filters are available for IAB category, app store id, advertiser name and app name. You can set up filters for a specific Ad Unit and copy those settings to another ad unit. Under Filters, you will see a drop down on the right to select the Ad Unit that you’d like to copy the filters from. By using Flurry SDK you can enable your app to server full screen display, full screen video, native display and native video ads. See more here. If you have virtual currency in your app, you can earn significantly more ad revenue by using rewarded video ad units. Yes, you can change the settings of your Ad Unit from Flurry’s developer portal. Changing an ad unit from rewarded to non-rewarded can be done in just a few minutes. If you want to designate an ad unit as Rewarded you must first define your rewards on the Rewarded Options page. For more information, click here. You can enter the amount of reward you want to give to the user for every $1 earned by you. The amount of reward displayed to the user depends on how much revenue will generated for completing the action. It is also possible to enter a minimum amount of reward to be given to the user irrespective of revenue earned. Yes, for Rewarded ad units, it is required to set up a server to receive notifications from Flurry through the callback url. You can enter this callback url, as well as the quantity, type and image of the reward on the developer portal itself. Refer the following link for more details: Rewarded Ads. We also allow for Client-Side rewarded ad units that do not require this setup, but rather leave the task of rewarding the user up to your app. Callbacks can fail for several reasons. First and foremost, it is important to double check your callback set up. Make sure that your URL is correct, and that all params that can be filled out by Flurry are included. It is always a good idea to verify with the dev portal tools that the end point is being reached. If the dev portal is giving a failure on contacting your server, make sure that your server is online and that it is returning a 200 response when the callback comes in. Flurry uses this 200 response to determine if a callback is successful. Without it, we assume it has failed. Android samples are located in this document . Each advertiser sets the frequency cap for each campaign run by Yahoo. The caps can be set for the number of ads a device can see per day, per week, or per lifetime of the campaign. Typically the the daily cap is set to 2 ads per device. The ad served reflect the language setting of the device and the device’s current geo location. Most ad preference changes take effect within 20 minutes. Reporting data can take several hours to display within the developer portal. At the top right of every chart is a “Download CSV” link. The link will include the date range and zoom interval (days/weeks/months) selected on the chart. For interstitials, place your Ad Unit at natural breakpoints in the user experience, such as after a completed round. Native ads can be blended into the content of your app. 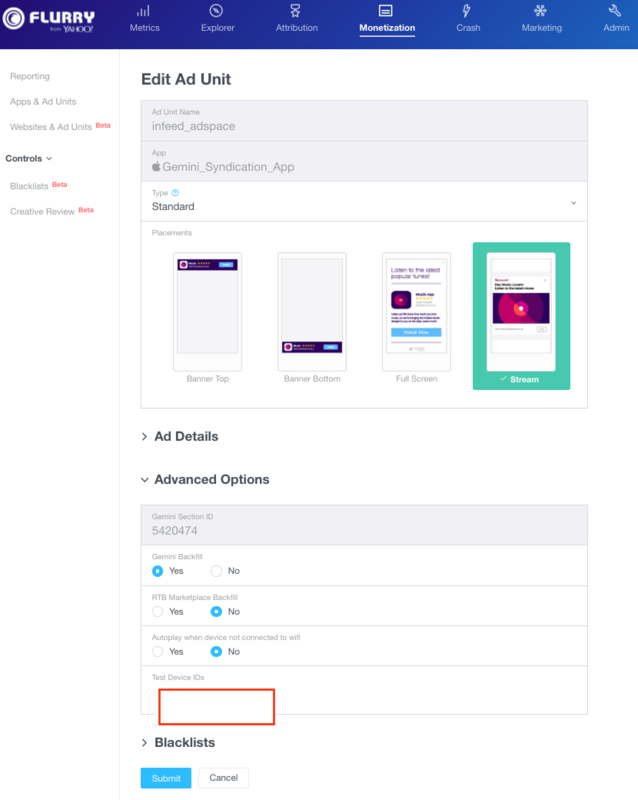 In the Advanced Options section of your Ad Unit setup, you can filter out advertisers by advertiser name, app name and app store id. You can set up a basic ad unit and include it in your app code very quickly. A publisher familiar with the process can complete integration in 10 minutes. Yes, you do need to create an ad unit on the dev portal first before referencing it from your app’s code. No, Flurry designed the Ad Unit set up for everyone. Any non-technical user can create and edit an Ad Unit. Once the Ad Unit is created in the developer portal, the user can email or copy and paste the Ad Unit code for the person responsible for integrating the code into the view controller. You can change your ad mix and ad filters from the Monetization tab in the developer portal. You can not change the appearance of takeover ad units. However, Flurry also offers native ads that allow for ad assets be combined by the app developer to match the look and feel of your app. The icon, also known as the “Advertising Option Icon”, is an industry-standard sign for consumer information and control for interest-based advertising. When a user sees the AdChoices Icon on an ad, it lets them know that information used to infer their interests is being gathered or used to improve the ads they see. By clicking on the AdChoices Icon, they can learn about how interest-based ads are delivered. More importantly, the AdChoices Icon gives users the ability to control whether they receive interest-based advertising. All Flurry’s and direct-sold ads with gender/geo/persona targeting will display the AdChoices icon in the upper right-hand corner. that are wrapped around our latest SDKs to provide easy integration of Flurry features into a Unity game. When using the Prime31 plugin, you still acquire API key from Flurry’s dev portal and refer back to it for all server side configuration of ad units and ad serving campaigns when applicable.